You won't find a more flexible and better sounding phono stage for the money than the Pro-Ject Phono Box RS. 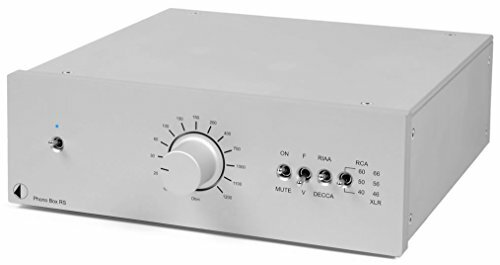 This ultra low-noise and ultra low-distortion preamplifier is made for the audio connoisseur. It offers breathtaking performance, thanks to the dual mono circuit topology and advanced design. The Phono Box RS can adapt to any phono cartridge. You can use either a fixed gain setting or variable gain, which can be set on the front panel at 40, 50, or 60 dB. The Phono Box RS's innovative 'infinitely' variable impedance control, also located on the front panel, offers continuously variable impedance between 10 and 1200 ohms. Impedance adjustment can be made during playback. Adjustable input capacitance via rear panel settings gives you a choice of 100, 200, 300, 420, or 520 pF. All of this adds up to a phono preamp that can be perfectly adjusted to get the best performance from any phono cartridge. This highly specified phono stage uses premium parts throughout its construction, including the SSM2019 latest generation audio preamplifier from Analog Devices as the input stage and a Linear Technology LT1010 as the high current buffer stage. The result is extremely low levels of distortion and noise. The very low output impedance makes the Phono Box RS insensitive to selection of interconnect cables and lengths. For even more flexibility in the sonic signature of this unit, fully passive RIAA or DECCA equalization is selectable. Phono Box RS offers fully balanced circuitry as well as both XLR and RCA inputs and outputs. As a result of all of this technology and design excellence, vinyl playback will never have sounded as clear, detailed, and smooth as with this superlative phono stage.